Condenser microphones are incredibly important when it comes to building a studio. They are the centerpiece of all gear setups. If you’re looking to buy a microphone specifically for recording and are asking which type to look into, we usually recommend going with a condenser microphone. In our opinion, it may seem like there are a lot of condenser mics out there to choose from, but if you narrow it down through research in terms of the overall reviews, cost-to-quality and personal use we’ve experienced, finding the top 10 wasn’t as difficult as we thought it would be. To choose your mic, it depends on a few factors: your budget, how big of a diaphragm you want and the majority of what you’ll be using it for. 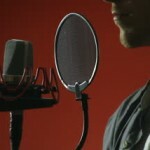 Lets review the top 10 best condenser microphones in the market. A condenser microphone is a specific type of recording device that’s all about fidelity. They are extremely responsive and clear as to what is in front of them, whether it is vocals, strings, brass, drums and more. They come in quite a few different shapes and sizes as you will see, but most of them have large diaphragms to pick up what you’re throwing at it while isolating the sounds from it’s surroundings — perfect to get that clear recording you need. Technically speaking, the condenser diaphragm vibrates in relation to the sound pressure that is given. A common question we hear is: what is the difference between a dynamic and condenser microphone? To put it simply, dynamic microphones are best used for live performances while condenser mics are recommended for recording. Also keep note that these things are extremely powerful. So powerful that the amplifiers built-in to them are not enough to most optimally record with them. With that being the case, you’ll need some phantom power: an external device to power that baby up. The most common form of phantom power comes in either a microphone preamp or audio interface — a little box that hooks up to your computer or mixer to amplify the microphone while giving you some options for control of gain, FX, and more. Although, some condenser mics come with a power supply that does just that. You can also look for condenser mics that plug-in straight to your computer. 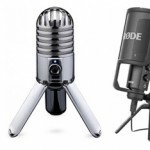 Read our 10 best USB microphones if you’re interested in that alternative. 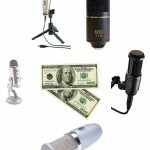 The following is our list of best condenser mics in the market. We’ve sorted them by price to give you a broad range of choices and brands. We’re always open to discussion, so let us know if you think we’ve missed a model or two. What is your favorite mic? We’re all ears. Read our 10 best mics for recording vocals if you’re looking to strictly record that way. Here’s one of the nicest Rode mics, or condenser microphones in general for that matter. 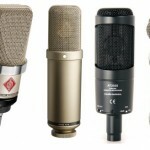 It’s one of the largest standards in terms of microphones within the music industry. An extremely warm, clear cut sound, the ultra low noise records what’s strictly in front of it and nothing else. The diaphragm is gold plated so it’s higher quality than most and the range is perfect for a lot of different applications, although this is butter with vocals. Comes with a dedicated power supply so you can skip out on buying an audio interface if all you need is phantom power. It’s double the price of the NT1-A but three times as good. 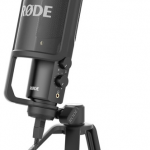 You’ll need to buy a shock mount and other accessories for it, but if you buy a Rode NTK, you’re getting one of the best condenser mics on Earth, period. This is the only USB microphone we’ll mention here since we’re opposed to them in terms of sound quality (although they continue to increase in tech, but for now we’re not happy). Audio-Technica is famous within the microphone realm, so if you go with this one you’re backed up my hundreds of reviews around the net. It gives us A high sound pressure level (SPL) so it can handle loud volume very well, is side-address (picks up right in front of you) so it cancels out other angles (sides and rear) effectively, and will last you quite a few years with a solid build. It’s around the same price as the Nova, but grab this if you firstly want USB connectivity and can manage a bit better sound quality by sacrificing purchasing the accessories separately. Get the Audio-Technica AT2020 if you want an affordable, famous, and solid condenser mic. This is a very popular condenser mic because it’s affordable but also I mean, it’s gold-plated, so it looks sleek and important as well. The condenser capsule is 32mm so it has a very big pickup pattern to grab all of the frequencies correctly and the built-in preamp is solid, although an audio interface is still needed to use it effectively. It’s mainly designed for vocals and if you do use it for that the sound quality has a very mellow tone. I’ve heard of even some professional engineers using this due to the crispness of the quality — it’s extremely cheap, too. Grab the MXL V67G for a nice gold-plated and solid condenser mic. We currently use this microphone ourselves and Sterling Audio is a bit lesser known than others. The capsule is all-brass and the FET amplifier design is a bit of a difference than other condenser mics with tube amps built-in. A lot of people say it doesn’t matter, but we’ve learned that mics with FET is nothing — the difference is very minuscule, although some have said tube amps need less EQ’ing after you record it. We like the sound either way. The ST55 has a very smooth and clean sound to it, especially at the price, mirroring a lot of Rode makes. It sounds great with obviously vocals but also guitar and some other strings. Check out the Sterling Audio ST55 if you want an overall step up from our previously listed mics. Here’s one of our favorites. It’s a bit up there in terms of price when comparing to the others in our list but it’s justified with the quality it provides. It was a part of our best mic for rap vocals for a reason, offering a very wide dynamic range of frequencies when recording. Just a 1″ capsule diaphragm but the warmth Rode mics provides with their gear, and most specifically this one is critical. If you’re buying this you’re getting some of the best sounding recordings we can hear (besides some of the Neumanns). What’s also great is it comes with a bunch of accessories: shock mount, screen, bag and cables. We love the Rode NT1-A if you can afford it, you won’t be disappointed. If you do have a few more bucks, check out their NTK as it’s a bit better quality if it’s in your budget. Another one of our favorites comes from AKG microphones. One of the biggest pickup patterns with a condenser mic, with this price range you start to get some extra features for custom sounds. The C214 gives us a switchable attenuator (20dB) and a bass-cut filter. It has great close-up recording and handles very high sound pressure. An all-metal construction will last you years and it’s stated to be great for vocals and solo instruments. It also comes with a carrying case (solid like a briefcase, not cloth), windscreen and a shock mount. Grab the AKG C 214 if you want a step up from the others and get on a higher level. 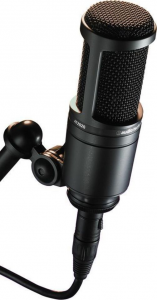 It was hard to decide on which Blue microphone to pick for this article, but we went with this one due to it’s overall quality and popularity. I first of all really love the look of this thing — it’s got a vintage old-school vibe to it. The condenser capsule is very high quality and the built-in circuitry provides excellent depth in the track recordings. One of the better condenser mics out there for around the $200 price range. There’s a built-in ‘Focus Control switch’, which allows you to increase the low-frequency sensitivity if you let’s say have somebody with a deeper voice or an instrument that is lower in the spectrum. What’s also great is it comes with a nice, wooden box to store it in. You then get a shock mount and pop filter, so the package is a huge plus if you don’t have those yet. Check out the Blue Spark for a solid choice if it fits your budget. 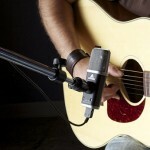 This continues our list with an affordable condenser mic by one of our favorite brands, M-Audio. Although they’re not too well-known for microphones, the Nova is highly praised due to it’s low price-tag, high quality cardioid pickup pattern (1.1″ diameter — pretty big) and overall rugged brass body. The build is what really gives it positive reviews. Another huge plus is the package comes with the necessary accessories: mount, soft case and an XLR cable (you’ll just have to buy a stand if you don’t have one already). Grab the M-Audio Nova if you want a condenser mic that’s around the $100 price point and can still give you excellent quality and a long-lasting build. We had to throw a Shure mic in here, and although their SM models of mics are more known for their dynamic patterns, this particular condenser mic is of very high quality. It most notably provides us with a 3-position switchable low-frequency filter for noise reduction. Combine that with the cardioid pattern and you’ve got a super isolated sound. The build is of high quality being all metal, and although not a tank it will get the job done because it has three mesh layers surrounding the pattern itself. What’s nice with this is the application (at least what Shure advertises it for, but has also been backed up by users): vocals, electric guitar amps, brass, strings, even drums (the low-frequency is especially noted with it). A high quality mic if you’re going to be recording (or even performing, although we do recommend going the dynamic route if that’s what you’re specifically using it for). The Shure SM-27-SC is a solid choice for multiple applications. All of the gear heads consider Neumann to be the bourgeois\Porsche of mics, but these things are seriously nuts with their technology. The sound is as good as you’re going to get. Although comparable to a lot of Rode mics out there, they still take the cake in terms of overall quality — it’s just unmatched, but of course you must pay for it. This is one of the cheaper models of their series’, just under a $1k but wow, check out the specs: A huge sound pressure level to 144 dB, a little presence boost above 6 kHz (gives the vocals some depth — although the organic heads will complain about it and would rather have raw tracks to EQ), and a super clean diaphragm that feels like a grenade in your hand. 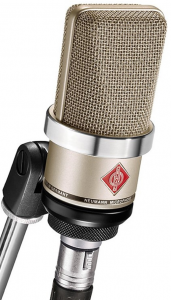 You can buy it in silver or matte black, but again, the Neumann TLM-102 is something for those who are serious and have the money. If you get this, you’re good to go for a very long time. You can also check out their other models if you want even more power, but this is the safest bet in terms of price-to-quality ratio (in our opinion).